You might wonder why there is so high number of phpMyAdmin security announcements this year. This situations has two main reasons and I will comment a bit on those. First of all we've got quite a lot of attention of people doing security reviews this year. It has all started with Mozilla SOS Fund funded audit. It has discovered few minor issues which were fixed in the 4.6.2 release. However this was really just the beginning of the story and the announcement has attracted quite some attention to us. In upcoming weeks the security@phpmyadmin.net mailbox was full of reports and we really struggled to handle such amount. Handling that amount actually lead to creating more formalized approach to handling them as we clearly were no longer able to deal with them based on email only. Anyway most work here was done by Emanuel Bronshtein, who is really looking at every piece of our code and giving useful tips to harden our code base and infrastructure. Second thing which got changed is that we release security announcements for security hardening even when there might not be any practical attack possible. Typical example here might be PMASA-2016-61, where using hash_equals is definitely safer, but even if the timing attack would be doable here, the practical result of figuring out admin configured allow/deny rules is usually not critical. Many of the issues also cover quite rare setups (or server misconfigurations, which we've silently fixed in past) like PMASA-2016-54 being possibly caused by server executing shell scripts shipped together with phpMyAdmin. Overall phpMyAdmin indeed got safer this year. I don't think that there was any bug that would be really critical, on the other side we've made quite a lot of hardenings and we use current best practices when dealing with sensitive data. On the other side, I'm pretty sure our code was not in worse shape than any similarly sized projects with 18 years of history, we just become more visible thanks to security audit and people looked deeper into our code base. Published on Nov. 28, 2016, 6 p.m.
Slightly behind schedule (it should have been released in October), Weblate 2.9 is out today. This release brings Subversion support or improved zen mode. Use "Watched" instead of "Subscribed" projects. Improved intuitivity of languages selection in profile. Added support for uploading visual context (screnshots) for translations. Today, new version has been deployed on Hosted Weblate. It brings many long requested features and enhancements. As you can see it can get pretty big for projects with many translations, but you get complete picture of the translation status in it. You can find all these features in upcoming Weblate 2.9 which should be released next week. Complete list of changes in Weblate 2.9 is described in our documentation. Published on Oct. 25, 2016, 6 p.m. Published on Oct. 14, 2016, 6 p.m.
Slightly later than on monthly schedule but Weblate 2.7 is out today. This release brings improvements to the API and is first to officially support wlc a command line client for Weblate. Extend API (detailed repository status, statistics, ...). You can find more information about Weblate on https://weblate.org, the code is hosted on Github. If you are curious how it looks, you can try it out on demo server. You can login there with demo account using demo password or register your own user. 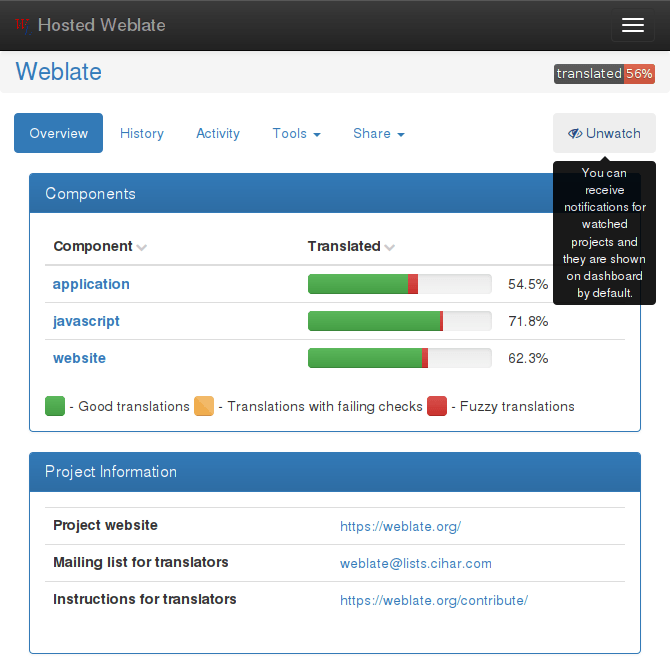 Weblate is also being used https://hosted.weblate.org/ as official translating service for phpMyAdmin, OsmAnd, Aptoide, FreedomBox, Weblate itself and many other projects. Published on July 10, 2016, 11 a.m.
wlc 0.4, a command line utility for Weblate, has been just released. This release doesn't bring much changes, but still worth announcing. The most important change is that development repository has been moved under WeblateOrg organization at GitHub, you can now find it at https://github.com/WeblateOrg/wlc. Another important news is that Debian package is currently waiting in NEW queue and will hopefully soon hit unstable. wlc is built on API introduced in Weblate 2.6 and still being in development. Several commands from wlc will not work properly if executed against Weblate 2.6, first fully supported version will be 2.7 (current git is okay as well, it is now running on both demo and hosting servers). You can usage examples in the wlc documentation. wlc 0.3, a command line utility for Weblate, has been just released. This is probably first release which is worth using so it's probably also worth of bigger announcement. It is built on API introduced in Weblate 2.6 and still being in development. Several commands from wlc will not work properly if executed against Weblate 2.6, first fully supported version will be 2.7 (current git is okay as well, it is now running on both demo and hosting servers). You can find more examples in wlc documentation. Published on May 19, 2016, 6 p.m.
Today it's fifteen years from my first contribution to free software. I've changed several jobs since that time, all of them involved quite a lot of free software and now I'm fully working on free software. I've updated (translated few added messages) Czech translation of phpMyAdmin. Many other contributions came afterwards, several projects died on the way, but it has been a great ride so far. To see some of these you can look at my software page which contains both current and past projects and also includes later opensourced tools I've created earlier (mostly for Windows). These days you can find me being active on phpMyAdmin, Gammu, python-gammu and Wammu, Debian and Weblate. Published on May 14, 2016, 11:23 a.m.